The Construction Specifications Institute’s (CSI’s) MasterFormat© 2004(1) is the latest edition of the construction industry’s standard for organizing construction information (including specifications) and has a substantial impact on the mechanical insulation industry. Mechanical insulation was formerly limited to a single section or category of sections within Division 15–Mechanical. 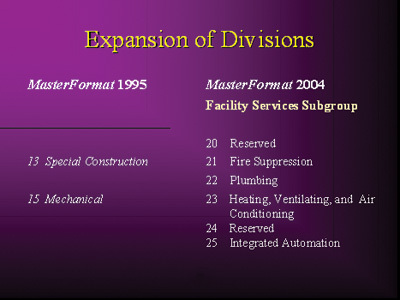 In the 2004 edition of MasterFormat, Division 15–Mechanical has been discontinued. Instead, in the new 50-division numbering scheme, CSI reserved Division 15 for future building-construction subjects. Mechanical specifications are now in several divisions in a new subgroup titled “Facility Services.” The new divisions that include mechanical specifications are Division 21–Fire Suppression; Division 22–Plumbing; and Division 23–Heating, Ventilating, and Air Conditioning. 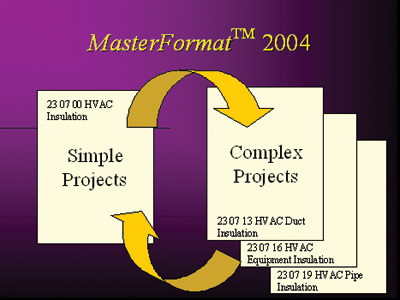 This version of MasterFormat is the most recent in a succession of updates to the industry standard. From its early inception, the document has undergone many changes. In 1978, it first became known as MasterFormat, and it set the standard of 16 divisions and a five-digit numbering scheme. In the 1978, 1983, and 1988 editions, CSI located all mechanical specifications in Division 15–Mechanical. Within that division, CSI slotted mechanical insulation in a series of sections beginning with the number 15250. CSI further assigned numbers and titles subdividing mechanical insulation into separate sections for ducts, equipment, and pipes. This additional subdividing gave specification writers flexibility. For simple projects that included few services to be insulated and required few insulation products, one could specify all mechanical insulation in a single section, 15250?Mechanical Insulation. In complex projects with many services to be insulated—each with varying conditions and different requirements for insulation materials, thicknesses, and coverings—the specifier could separate mechanical insulation into 15251–Duct Insulation, 15252–Equipment Insulation, and 15253–Pipe Insulation. Subdividing in this fashion did not duplicate information, because the requirements were different for each section, and it helped contractors find particular information more quickly. In 1995, mechanical insulation moved to a new location in Division 15–Mechanical: a series of numbers and titles beginning with 15080. In this location, as in previous schemes, the subject was subdivided using numbers and titles. In the 2004 update, this organizational scheme continues, but mechanical specifications are now split among several divisions. This requires the insulation subjects also to split among those divisions. The new scheme allows the subjects in each division to be further subdivided for complex projects. In June 2005, MASTERSPEC©(2) Specifications, the leading commercial master specification system in North America, implemented the new scheme by separating Section 15080 into three sections. For an implementation period (approximately 2 years), MASTERSPEC will be offered in both schemes. In the MasterFormat 1995 Edition numbering scheme, the sections are 15081–Fire-Suppression Systems Insulation, 15082–Plumbing Insulation, and 15083–HVAC Insulation. These sections in the MasterFormat 2004 Edition have the same titles and are numbered 21 07 00, 22 07 00, and 23 07 00, respectively. This is an initial step. Future updates are planned to separate these sections more finitely within each division. This will be especially useful for complex projects that require several different materials and applications. Mechanical insulation is in its new home in the three new mechanical divisions (21, 22, and 23), each of which has insulation placed in a consistent location (21 07 00–Fire-Suppression Systems Insulation, 22 07 00–Plumbing Insulation, and 23 07 00–HVAC Insulation). Each division could have a single or multiple sections, depending on the complexity of the project requirements. This separation, while controversial, poses no threat to contractors bidding on mechanical insulation, and it does not present a condition of three identical specifications. The requirements for the three facility services are substantially different, as are the contents of the specifications for each. It is much like the situation with building and roofing insulation, which have different locations in the MasterFormat numbering scheme for insulation products. The initiatives of the National Insulation Association (NIA) to enhance the importance of mechanical insulation and establish its rightful role as an engineered system have brought increased emphasis on and awareness of the content and organization of mechanical insulation specifications. There is an increase in the variety of available insulation products. There are also varying environmental conditions in which insulation must be applied and can function, and different purposes for insulating ducts, equipment, and piping that require different materials and applications. When insulation systems are carefully engineered, the results usually include different materials, varying thicknesses, and varying installation requirements for each building service, as well as for the same services installed in different environments. These developments have created a need to more carefully, accurately, and comprehensively specify construction-contract requirements relating to mechanical insulation. Keeping the construction-contract documents organized so that readers can retrieve specific information easily during bidding and construction phases has necessitated a review of how mechanical insulation specifications should be written and organized. Comprehensive mechanical insulation specifications must communicate construction-contract requirements for the set of whole project requirements. Insulation is rarely, if ever, indicated on drawings, except for the occasional detail of how to insulate a particular item like a fitting or valve. So the specifications, as one part of the construction-contract documents, must describe what services to insulate, the materials to be used for each service (which often varies with the service size), and the thicknesses to be applied (which also often varies with service size). Additionally, the specifications must include detailed descriptions of vapor barriers, protective coverings, arrangements with service-supporting devices, quality of workmanship required, and means of ensuring that the specified materials are being used and applied as prescribed. These are complex requirements and necessitate carefully written and organized specification sections. The requirements within a specification section or series of sections must be organized so that end users can easily find the information that they need. This organization of the content will depend not on the contract sum, but on the complexity of the project. Complexity depends on the number of services to be insulated and the number of different materials required to fulfill the design requirements for the project. Another format document published by CSI is SectionFormat©. This document sets the standard location of subject matter within a specification section and divides a section into three standard parts: Part 1–General, Part 2–Products, and Part 3–Execution. Part 1 includes administrative requirements that are unique to the subject of the section (insulation), without repeating requirements specified in Division 01–General Requirements. Part 2 is the location to specify materials and products, without regard to how or where they are applied in the project. Part 3 is the location to specify installation requirements, services and equipment to be insulated, and varying thicknesses for differing service sizes, without duplicating the product descriptions specified in Part 2. The most complex specification requirements are for piping systems because one must consider pipe material, service temperature, ambient temperature, moisture conditions, and protection from physical damage. Often, the specifications for pipe insulation must be written with the understanding that the contractor has various options for which materials to use. A specifier for hydronic piping may give the contractor the option to use plastic, copper, or steel pipe material. Each may require different insulation material and thickness. Often, the pipe material changes with pipe size. For example, hydronic piping NPS 2 (DN 50) and smaller is often specified to be copper, while piping NPS 2½ (DN 65) and larger is often specified to be Schedule 40, black steel with welded and flanged joints. The insulation specifier must know the contractor’s options for pipe materials to accurately specify the insulation materials and thicknesses. In addition, each service usually passes through different environments, including air-conditioned and non-air-conditioned spaces, areas where physical damage is probable, and spaces where damage is not likely. These conditions add complexity to the specifications because they determine the insulation materials, requirements for vapor barriers, and whether or not protective coverings are required. Often, there is a mix of requirements because the same service resides in all of these conditions and at varying sizes. These are all factors in the insulation system design problem. Once the insulation system is designed, the engineer must create a specification that ensures the solution is fulfilled. Masterspec offers a master-guide specification with insulation product selection and specification-writing guidance. It is peer reviewed by practicing engineers who use Masterspec and by insulation manufacturers’ representatives and industry associations, including NIA. MasterFormat is published by the Construction Specifications Institute (CSI) in Alexandria, Virginia. MASTERSPEC is a product of the American Institute of Architects, published by Architectural Computer Services, Inc. (ARCOM), and endorsed by the American Council of Engineering Companies and the National Society of Professional Engineers. MASTERSPEC is also the basis of the Midwest Insulation Contractors Association (MICA) National Insulation Standards, published by MICA under a special agreement between MICA and ARCOM.